The Latino Comics Expo is the nation’s first convention dedicated to highlighting the work of comic book creators, illustrators and others in the literary and visual arts whose work reflects the influence and celebration of Latino culture. 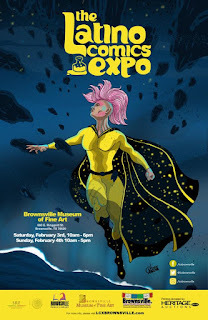 Founded in 2011 by Bay Area arts patron Ricardo Padilla and Los Angeles cartoonist Javier Hernandez... the Expo has hosted a wide variety of creative talent from the world of comics, web comics, illustration and design, political comics, graphic novels, children’s books, filmmakers and animators. Veteran creators, newcomers, independent artists, scholars, female, male, LGBT. All have contributed to making the LCX the premiere showcase for Latino pop culture in all it’s various mediums. In addition to our vibrant exhibit hall where attendees can meet one on one with the creators, the LCX is known for it’s wide variety of panels and workshops. Topics have included self-publishing, crowdfunding, Latina Power, individual author spotlights, historical presentations, scholarly studies, workshops for kids and more. The Expo is a place to celebrate creativity, to educate, inform and learn, and to be able to share the richness of our various Latino cultures. This year's guests include Gilbert Hernandez, Hector Cantu, Lalo Alcaraz, Suzy González, Tone Rodriguez, among others. I think I first heard of the event in 2014 and I immediately thought it was brilliant that this show exists; I really hope I'll be able to attend one day. If you're able, I'd recommend checking it out for me!